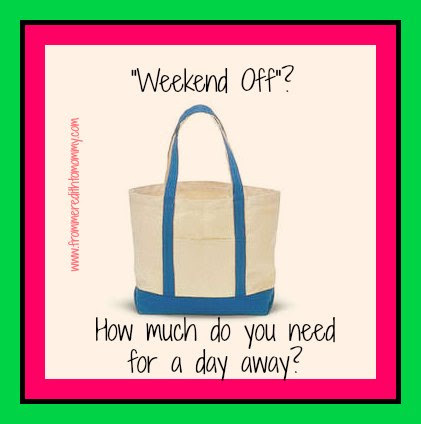 From Meredith to Mommy: The Myth of the "Weekend Off"
The Myth of the "Weekend Off"
Archive post #5. This was almost a year ago. From my experience in leaving the girls for a full day this past week, things are BETTER, but not yet EASY. This past weekend Adam and I attended the wedding of his best childhood friend. It was at a beautiful estate on the Hudson River, about 2 hours away from us. It was an evening wedding, so we stayed at a local hotel. It was an adults only reception, so it was just the two of us. MULTIPLE people told me how nice it would be for us to have a "getaway weekend" and a "night off from the baby". Sometime in the week leading up to the wedding, I would choose a dress to wear, and get my nails done. Saturday morning we'd pack an overnight bag (pajamas, toiletries, outfit for the drive home). Saturday afternoon we would leave around 2:00, check in at hotel, change, and attend the wedding. Sunday we would sleep in, have a nice breakfast out, and take our time heading home. We might even throw in a little side trip or stop. In mid-July, we had confirm overnight babysitters for each girls. Because Madison is embracing her two year old self and Reagan is still a very needy infant who isn't consistently sleeping through the night, we decided to split them up. Madison went to my in-laws since she's familiar with the dogs and the house is dog proofed, therefore a little more toddler proof. Reagan went to my parents where she could sleep next door to their room and visit with my grandmother as well. Two weeks before I made sure to track both girls and their schedules, especially Reagan, who is young enough where her schedule seems to change weekly. A few days before I sent each grandmother a two page write up of the schedule, routines, quirks and needs of each girl. I made a list of what each girl needed to take with her. Madison's list had 21 items, Reagan's had 28. I started a tote bag for each girl and put things in and crossed them off the list as they went in. Then I made lists of things that couldn't go in until the day we left. And I put sticky notes on things so I wouldn't forget anything, like Madison's Kai Lan cup or Reagan's frozen milk. Saturday morning I woke up early so I could shower (that is no longer a daily occurrence). I finished packing each of the girls (which included thawing many ounces of milk for Reagan and transferring the freezer bags to bottles). I loaded my car with all of Reagan's things and cleaned out the rest of the car (my parents picked Reagan up and drove my car to their house, since they were 40 minutes in the opposite direction), Adam's car with Madison's things. I stole a half hour to whip a coat of polish on my toes (as in, painted on top of the chipped polish) and pack for myself. At 11:30 my parents came to pick up Reagan, and I spent 30-45 minutes showing them all the baby paraphernalia and explaining how to buckle her in, fold, unfold, secure, assemble, disassemble, etc. I nursed Reagan one last time, and she left for her very first sleepover. Then I focused on trying to get Madison to eat lunch. We managed to get her in the car by 12:30 and thankfully she slept on the way to my in-laws (she's in a "I no longer nap at other people's houses" phase. It's fun.). We woke her up when we got there, transferred her carseat over, brought her things in and spent the next half hour or so getting her comfortable playing. THEN we left for New York. Once the two of us left, driving and getting there was the same as it would have been pre-kids...oh, except that we got there, and the first thing I did was pump. Thankfully we stayed in a hotel that had a mini-fridge in each room. Rather than a cute little clutch, I brought my giant mom purse to wear with my dress, because in addition to my license, lip gloss, cash, and mints (standard wedding purse) I had to bring the pump and an ice pack and storage bottles. The wedding was absolutely gorgeous. Beautiful setting right at sunset on the Hudson River. Aside from slipping away to pump, we enjoyed ourselves just like we would have pre-kids. We ate, we drank, I danced (Adam doesn't dance). I DID spend some time texting with both babysitters and found that one hadn't eaten dinner, and one was having a lot of trouble falling asleep, but overall, both assured me the girls were fine and to enjoy myself. So I did. By midnight I was completely exhausted, so I took the bus right back to the hotel instead of going to the after party, which ended at 2:00 am. I suppose I could blame that on the kids and how tired they make me, but honestly I've always been a "fold early" kind of girl. Still for purposes of this story...the kids make me exhausted so I skipped the after party that I TOTALLY would have gone to had I been childless. Let's all agree that's how that decision making went. As for sleeping in...well, let's just say, even though Reagan wasn't there to wake me up at 5:00, hmmm...how shall I put this...she made herself known in spirit. I pumped again, in the bathroom since I have the loudest pump in the world and didn't want to wake Adam, who DID attend the after party and rolled in at 2:30. I did manage to go back to sleep for a bit. Around 7:30, we both got up, I pumped again, we showered, and ate breakfast. Our goal was to be on the road by 9:00, because we had to pick up Madison, go home, get Reagan, switch cars BACK with my parents, reorganize and go to birthday party #6 (in 5 weeks....but that's another story). By the time we got the girls to bed Sunday night Adam and I were practically falling down with exhaustion from the weekend. In my "night off" I got no additional sleep, not even in the morning. The prep to get the four of us out of the house for less than 24 hours was unbelievable. Yes, in a few years, it will be easy. The girls will think it's a treat to sleep at Grandma or Gram's house and we might send them off just for the fun of it. They'll eat the food that's there, sleep in beds that don't need to be assembled just for them, and they'll bring....clothes. I'll use that time to, I don't know, clean out their closets or something. But right now, leaving a baby who is exclusively nursing is NOT quite the break it's supposed to be. (I did have to explain to a few people that you can't just "stop nursing" for a day or so. Not only will it mess up supply, it's painful!) It kind of felt like when people used to see me getting ready to be out for three days to work with the National Children's Choir and tell me they wished they could "have a few days off". Any teacher knows the prep work to be out is considerably more than just being in school (which is why so many teachers work sick). Not to mention that I was leaving to do more work! It was a beautiful wedding, and I loved spending time with just Adam. But as a "relaxing weekend away" goes...yeah, that's not quite a mommy experience!